T0rm3nted and IchiFutures like this. The U.S. Energy Information Administration reports official figures at 10:30 a.m. ET. Looming large over markets, however, were meetings on June 22-23 in Vienna of the Organization of the Petroleum Exporting Countries with other big producers, including Russia. Electricity has been clicking on and off since about lunch. Missed some opportunities, but scratched out $130 on a quick short an otherwise bad day. IchiFutures, T0rm3nted and Jrich like this. The price of crude oil is breaking out today as shown in the chart below. At $74.73/barrel, crude is now at its highest level in nearly four years. 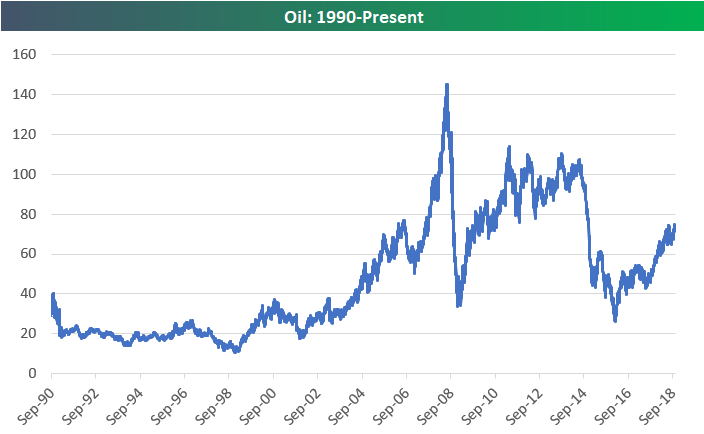 While the five-year chart above looks relatively constructive, an even longer term chart going back to 1990 looks more daunting for oil bulls. For the chart below to turn more bullish from a technical perspective, we’d want to see price move above resistance near $110. It has been a frustrating year for energy investors because even when oil was rallying during the spring and summer, stocks failed to benefit noticeably. In fact, energy stocks have been surprisingly disconnected from oil prices for a couple of years now. As shown in LPL Chart of the Day, energy stocks did not get any lift from rising oil prices in mid-2017 through summer of 2018 based on relative performance of the S&P 500 Energy Index versus the S&P 500. After trying to stabilize in the last few days, crude oil prices took another leg lower today, falling more than 5% and below $55 per barrel. Relative to its 52-week high on October 3rd (less than two months ago) crude oil prices are now down over 30%. 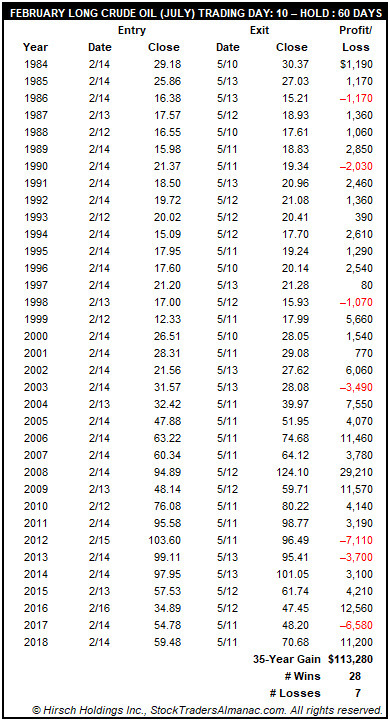 While there have been drawdowns of this magnitude in the past going back to 1991, there haven’t been many, and only five of them went on to see materially larger declines. Concerns regarding excess supply have pressured prices, but the magnitude of the recent declines doesn’t paint much of a positive picture for global growth. While US equities are set to trade lower on this holiday-shortened day after Thanksgiving, the big story is the sharp drop in crude oil prices. Crude is trading down over 5% this morning to another 52-week low near $50 per barrel. Looking at the chart, it’s amazing to see how sharp and fast the drop has been from what were multi-year highs just a few short weeks ago. In the span of just 36 trading days, prices have dropped by about a third! 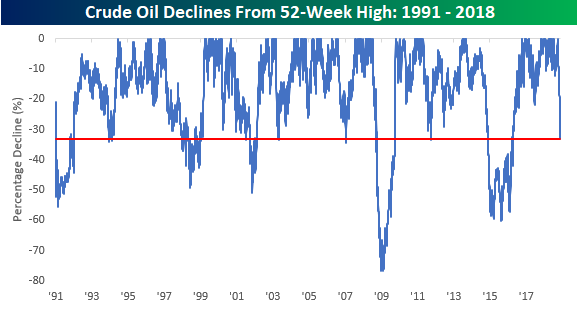 Looking back at crude oil declines over time, the magnitude of this drawdown is right up there with some of the biggest on record. 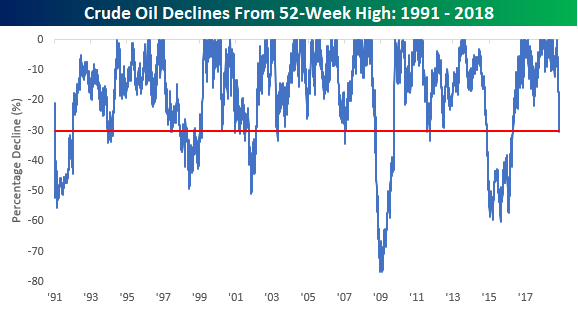 The last time prices were down this much from a 52-week high was in 2015 and 2016, but the key difference between now and then is that the magnitude and length of this decline (at least up until this point) has been shorter and less severe. 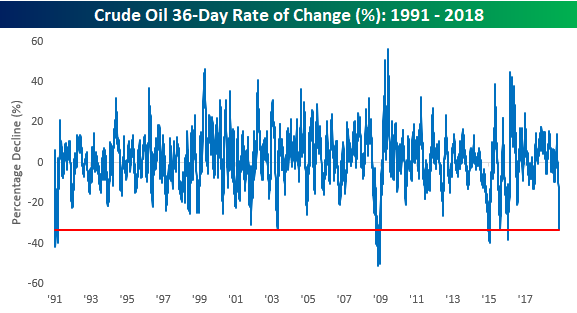 We realize that measuring a 36-day rate of change is a bit arbitrary, but just to show how sharp a decline this has been, there haven’t been many other similar lengths of time where crude oil declined more over a such a short period of time. The US Secretary of Energy said that Saudi Arabia is ready to cut oil production significantly more than what the OPEC Plus agreement requires. Donald Trump also supported the oil quotes, saying he was ready to extend the period of negotiations to reach a trade agreement with China. Oil should be bought now. Oil has really risen in price. My last post was on Friday. The picture is a weekly chart. The last bar is the movement this week. @Kat that was my first attempt at trading a pattern using ichimoku 10 years ago. I called it the bucket. ks below ts and price > ts and < ks. I didn't have success however it brought back some memories seeing that chart. 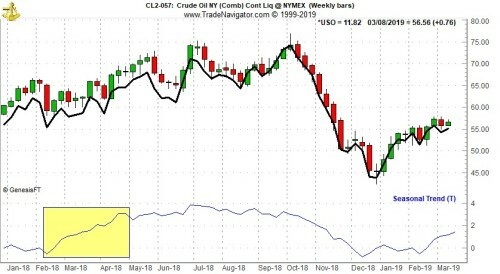 Crude oil has a tendency to bottom in mid-February and then rally through July with the bulk of the seasonal move ending in late April or early May. It is that early February low that can give traders an edge by buying ahead of a seasonally strong period. Going long crude oil’s July contract on or about February 14 and holding for approximately 60 days has been a profitable trade 28 times in 35 years, for an 80.0% win ratio with a cumulative profit of $113,280 (based upon trading a single crude oil futures contract excluding commissions and taxes). Crude oil’s seasonal tendency to move higher in this time period is partly due to continuing demand for heating oil and diesel fuel in the northern states and partly due to the shutdown of refinery operations in order to switch production facilities from producing heating oil to reformulated unleaded gasoline in anticipation of heavy demand for the upcoming summer driving season. This has refiners buying crude oil in order to ramp up production for gasoline. 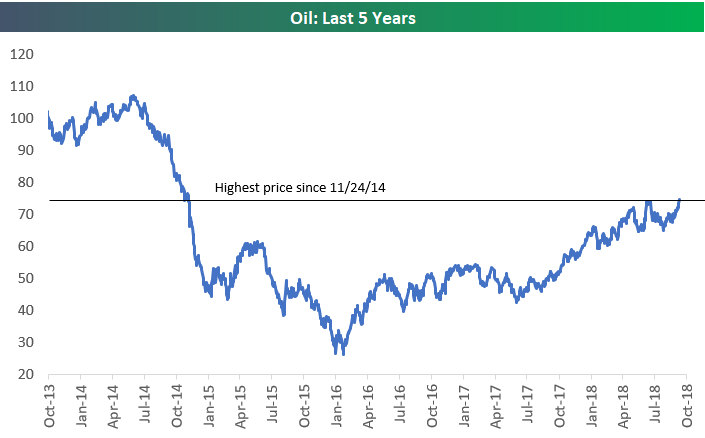 Crude has been ripping higher with stocks since Christmas, but there is plenty of time left in this seasonality and the recent consolidation in oil prices may provide another entry point. OldFart and Fxortrader like this. US President Donald Trump on Thursday called on the Organization of the Petroleum Exporting Countries (OPEC) to encourage oil production to reduce commodity prices. "It is very important that OPEC increase the flow of oil. The world market is fragile, the price of oil is too high. Thank you!" Trump wrote in a post on Twitter. Immediately after Trump's tweet, US crude oil futures fell more than $ 1 to $ 58.33 per barrel. Crude oil prices have risen this year amid a reduction in supply by OPEC and U.S. sanctions. against OPEC member countries, Venezuela and Iran. The decline in production has caused tightening of oil inventories. Onepoint272 and OldFart like this.